After a month-long fasting in the month of Ramadan, Muslims all over the world celebrate a thanksgiving in the month of Syawal. Eid-Mubarak means “Blessed Celebration”. 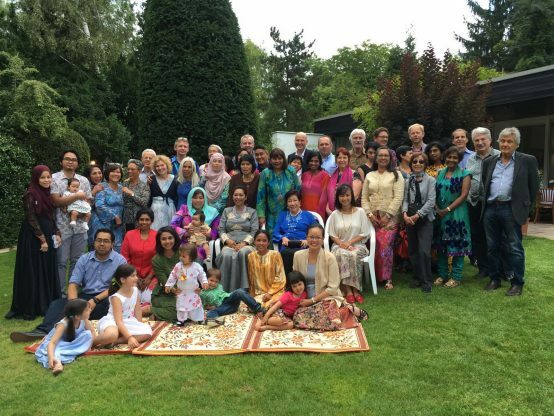 It has been an annual tradition of the Malaysian Club Deutschland (MCD) to host the Malaysian-style Eid-Mubarak celebration with our Malaysian-German members and their families and guests. 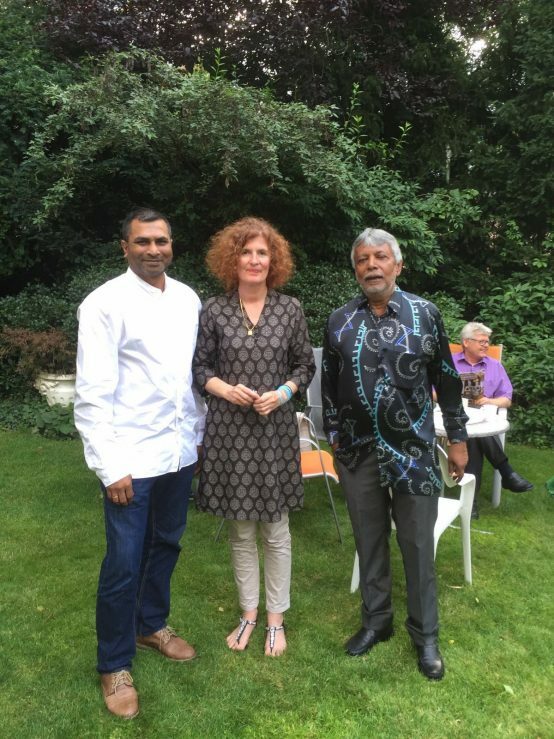 This year, both the consul-general of Malaysia in Frankfurt and MCD jointly hosted the event at the Consul-General’s official residence in Sachenhausen on 28th July. 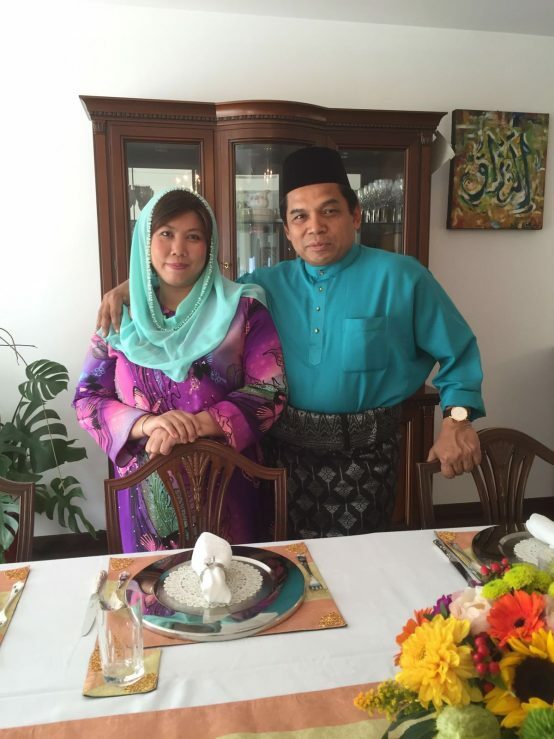 Our lovely Consul-General Adina Kamarrudin and spouse Mahzan Samad in their traditional Malay attire. The joint event kicked off in the afternoon with the official celebration with guests of our host Consul-General Adina Kamaruddin and her spouse Mahzan Abdul Samad. Her guests include fellow consul-generals from Pakistan Nadeem Ahmad, Turkmenistan’s Orazmukhamet Annabayez, deputy CEO of KT Bank Ahmet Kudsi Arslan, German tourism agency Wolfgang Meschonat. 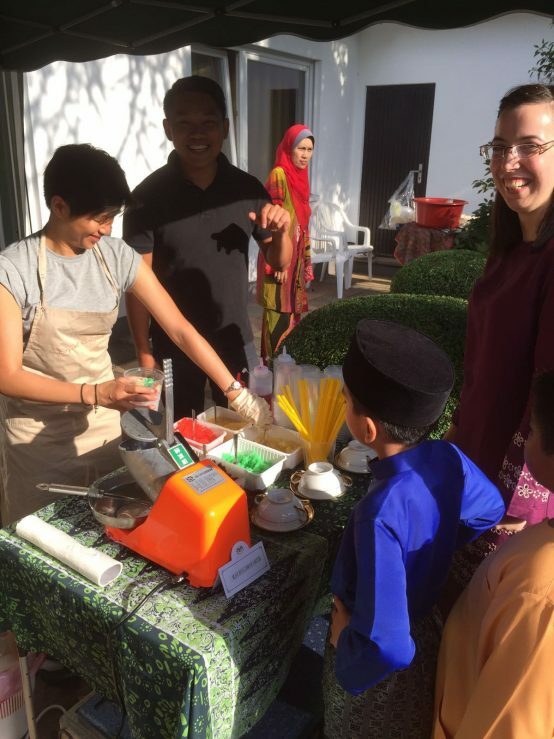 The guests were entertained with live demonstration of grilling chicken satay, our famous Spiess (skewer), making roti canai and ABC (ais batu campur), a mixture of syrup and sweet condiments on shaved ice. 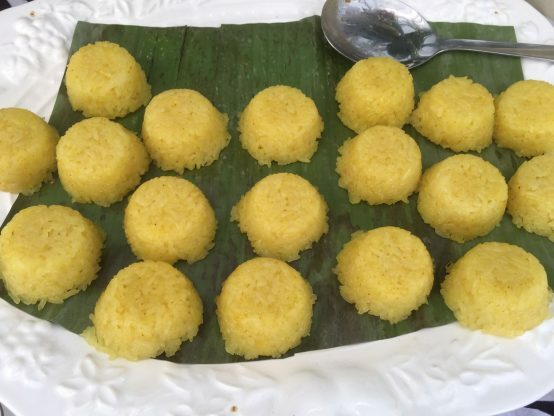 The guests were extremely delighted with our Malaysian way of celebrating one of the important festivals in the Islamic calender. 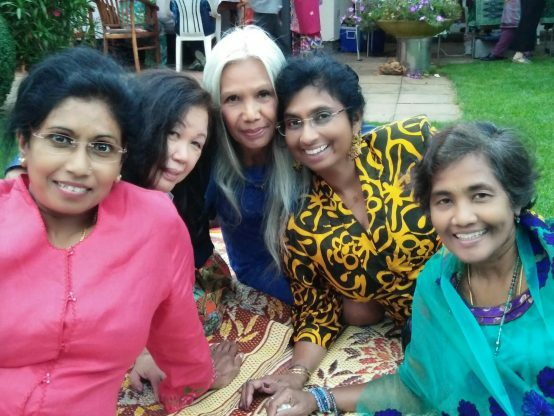 The event is also a showcase of the diversity and inclusiveness of our Malaysian culture wherever we are – in and outside of our home country, according to Adina, who is also MCD’s patron. Our German guests enjoying themselves and posing for a photo shot. 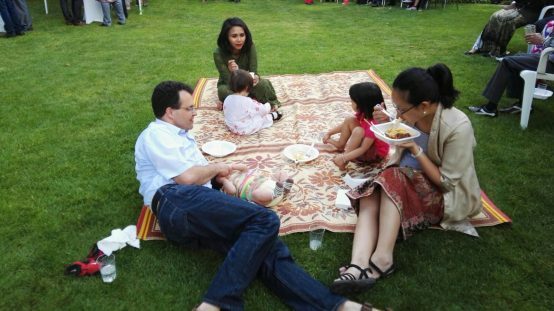 The informal celebration begins in the evening for MCD members and their family members, Malaysian students as well as consular staff. This year, the event is “by-invitation only” to club members as part of the Club’s appreciation to our members for their continuing support. 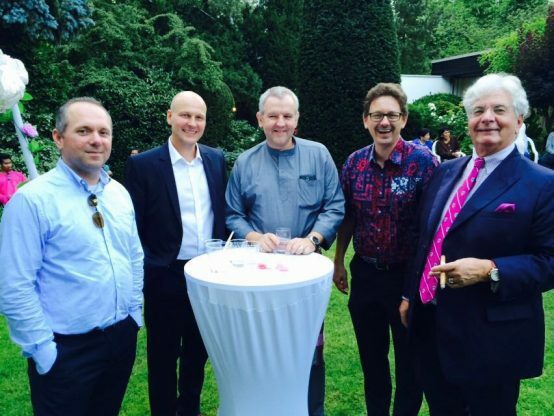 The resounding success of past club events such as MCD Ball in 2015 and the recent Parade der Kulturen in 2016 owed greatly to selfless contribution of time and efforts of many members within and without of Frankfurt. Such was the spirit of camaraderie (muhibbah) and gotong-royong that has made the club a successful and still around for the past 19 years. In fact, many of these members were behind the scene in preparing the food for our official guests and members in the past 3 days, under the leadership of club patron Adina Kamaruddin and president Rosita Heilek. Like the saying goes, “the way to a (man’s) person’s heart is through his stomach”; and we Malaysians sure know how to hit the right chord. 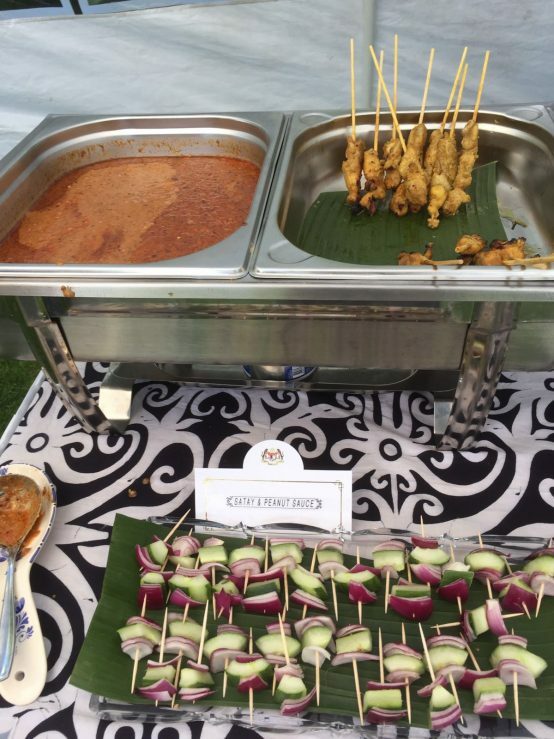 Our traditional delicacies such as satay ayam, nasi empit, beef rendang, roti canai,, mee goreng and various types of Raya kueh definitely made it to the stomach and heart of consul-general’s official guests and our members. 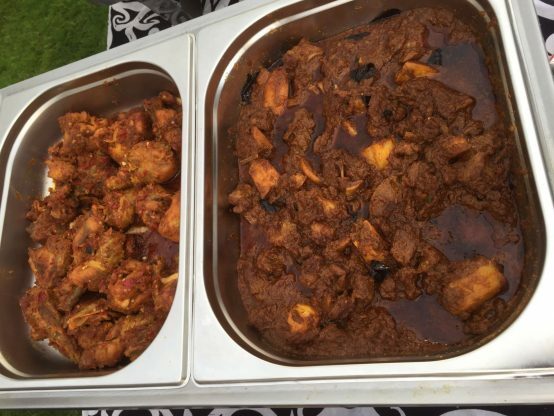 No one would deny the signature dish of our consular-general – lamb curry – was the best and none left till the end. Some of Malaysia’s heart-warmers. No one would deny themselves a second or third helping. Such events not only bring our members closer together but also members whom we have not seen for many years returning. In fact, we recruited a handful of new members and brought back old ones. We hope that through such events and more publicity given, we can bring all Malaysian diaspora together. 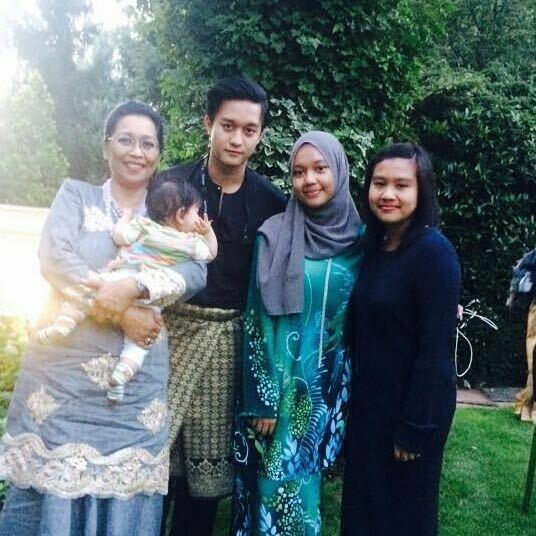 Selamat Hari Raya Aidil-fitri to our Malaysian family and to all our Muslim members and friends all over the world! Maaf, Zahir dan Batin. For membership information, please visit http://malaysianclubgermany.de/about-us/membership/ or contact our secretary Iris Schneider at mcd.deutschland @ yahoo.com.